Chippendale Mahogany Reverse Serpentine Slant-Front Desk. The Rectangular Top, Fitted With A Hinged Lid, Opening To Reveal A Writing Surface And Centering A Carved Fan Prospect Door. 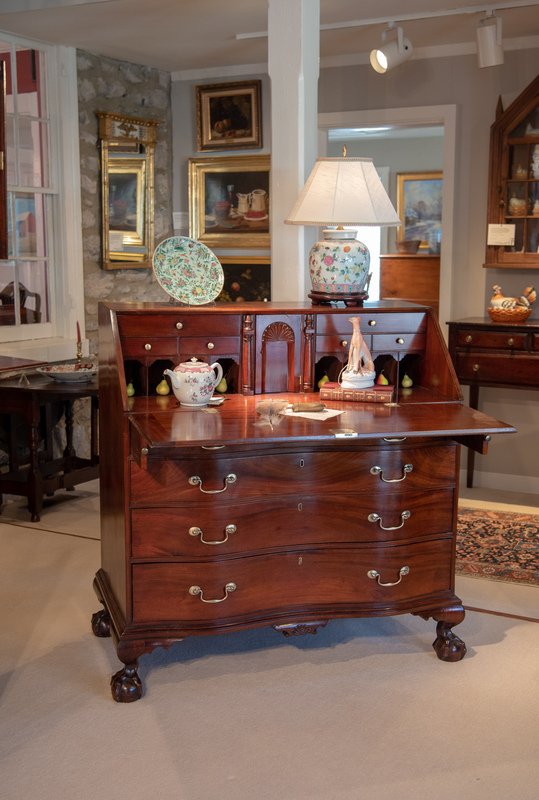 And Two Interior Small Drawers Flanked By Document Slides And Small Drawers, And Pigeonholes, Above Four Large Drawers, With Beaded Surrounds And Retaining The Original Bail Brasses. The Molded Base With A Carved Fan Drop Pendant, Raised On Ball-And-Claw Feet. Beautiful Condition, With Early Surface. Massachusetts, Circa 1770-1785 H. 44" W. 41 1/4" D. 21 1/4 D. Open 35 1/2"